By now, you probably have seen the first iPad TV commercial aired during the Oscars. If you missed it, you can watch it here. To those of us who have been following tech news in the past few months, the video didn’t show anything new. In fact, it’s a rather ordinary, formulaic Apple commercial. It’s very similar to the 2007 iPhone launch commercials. I’m not going to talk about the iPad today, instead I want to focus on how Apple markets its products. Apple’s commercials are effective. In the iPad Ad, the shots are always focused on how YOU would use the iPad. 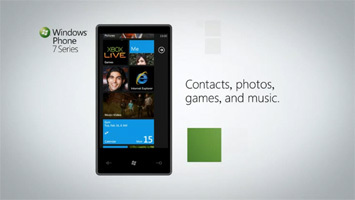 In every shot, you get a clear picture of the user interface and how it operates. On a more subtle note, the commercial shows someone using an iPad on a comfortable couch in an airy living room, just like where you’d be using an iPad. It feels intimate and natural. More importantly, the effectiveness is not only because it highlights the product, but also serve as a tutorial video. By watching the fingers in the commercial performing swipe, pinch zoom, double tap, the viewers build a familiarity with the iPad even before they ever touch one. I remember the first time I used an iPhone. It felt as if I’d owned one for a while, no instructions needed. The background setting provides an airy and soothing feeling. The soundtrack is uplifting but not overwhelming. These two factors establish a good mood. Maximum clarity on the product and its UI. Show many examples. Focus on how the product is operated, from a user’s point of view. Narrated in human language, not technical jargon. In comparison, most of Apple’s competitors don’t get it when it comes to marketing. I have seen the their commercials and they are forgettable. They simply focus on the wrong things. In this beautifully choreographed commercial, we see the phone for less than 15 seconds out of the full minute. My parents won’t get these geeky insider jabs. Wasting the whole promo ad on acknowledging the dominance of your competitor is a waste of air time. I still don’t know anything about the Droid. This one shows some screens, but very briefly. I can’t help to wonder who the star is here. The celebrities or the phone? I think this is a strong contender. However it still lacks the human element. A self-animated device feels very conceptual to me. Ironically, I’m a big fan of Microsoft’s 2019 concept video, which feels a lot more real. Actually these commercials are not forgettable. I remember the dancers in the open field, the edgy tag lines, and the guy who looks like Fred Durst just fine. One problem: I don’t remember the product. There are so many distractions it’s hard to focus on what they’re trying to advertise. I also don’t feel attached to their products. This is why I love Apple Ads. Regardless of whether or not I buy their products, I feel I’m already familiar with them. The presentation is simple, human, and effective. Interesting analysis. What is interesting to me is that, while most mobile device ads talk about one feature, Apple’s ads talk about versatility which, in itself, embodies many features. Another ad is Blackberry’s “All you need is love” spot. The worst, it’s all motion graphics, happy images, goodwill of the Beatles, but no concrete demonstration of why the product is good. 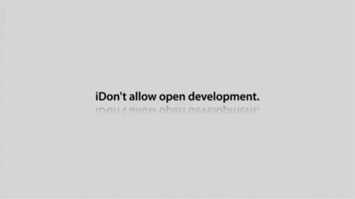 What’s amazing about Apple ads is that they can demo the software, and make it look great in a short spot, but unlike say a fake Hollywood OS, Apple’s stuff looks and feels great all the way down and for the long haul. Great post, and I totally agree. About nine months ago, a client of mine was pitching a concept for a new enterprise framework to her colleagues and superiors. I tried convincing her to take a page from Apple and create a simulation of how end users would experience the new system and *show* how much it would change their workday for the better. No go – I’m pretty sure she kept on using the same ol’ PowerPoint deck, replete with bullet points, jargon and nonsense charts. Sigh. Next time a client is in a similar position, I’m showing them this post! I agree with Nathan – the one aspect of the iPhone which I always mention is how it acts *exactly* the way you see it in commercials. What other product(s) are presented in that way? Here’s the device. Here’s *you* using it. Here’s the date when you can buy it. Fantastic analysis of their ads. You are absolutely right and, thinking back, I’m guessing that the first ads to do this was the iPhone ads which evolved out of the iPod ads. The original iPod ads were jarringly different from other ads on TV with massive use of whitespace, just silhouettes on bright backgrounds dancing to their white silhouette iPods. Not soothing but then the product was meant to be exciting. I mean, c’mon, it was just an mp3 player. But the iPod was the hip, cool, exciting mp3 player and the focus was on the product with all other info stripped out. Going back further… well, their ads have always focused on the product making them fun or cute, or on the the company image as “different”. It’s clear from the iPad ads they have taken all that they have learned from these past efforts and perfected their technique. The biggest success here, as you point out, is that those who watch the ads will subconsciously learn the use of the device and when they test one out in a store will find it so “easy and intuitive”. On what we geeks saw in the ad: Well, in the promo video Apple had they showed a video of a dog surfing in browser. Let me repeat that, it was IN BROWSER. You could then pop it out full screen if you wanted and close it down all with a neat transition zoom effect. This latest commercial did not show that. I am really keen to see if they’ve made it so videos can be played without jumping out of the current app and into the video app. If they do let us do that then there will be so many more apps and UI’s that can be created (and hopefully all this will be put on the iPhone). Nice post! I agree. 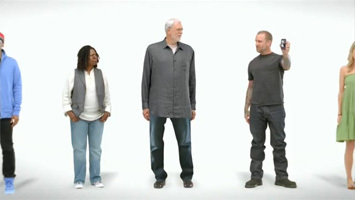 What do you think about Apple’s “Get a Mac” (Mac vs. PC) commercials? They’re different, focusing on how Macs are supposedly superior to Windows computers. While many Mac users I know were delighted by these commercials, I found them not very appealing (I wasn’t a Mac user at the time they started.) I’ve always asked myself if this was the right advertising strategy: insulting a product owned by your potential customers, even if they hated some aspects of it. @Omer, I think the key is to market the product to EVERYONE, not just spec hungry tech geeks. Apple presents its products comfortably, natural. This way, it’s easy for people like our parents to understand. @Nathan, it feels real. I think the “demo” approach really lures people. It eases the “new tech gadget anxiety” for the non-techy customers. @Erin, I’m beginning to see a trend in presentation slides. I see more of Job’s keynote style: simple messages, big and bold imagery. I haven’t see bullet filled slides in a while. @David, I can’t think of any. That’s why I said other products’ commercials are very forgettable. Example: while searching for the Youtube links for these commercials, they all seem interchangeable to me. And I don’t remember which ad was for which phone. Obviously they didn’t stress the product enough. Apple’s ads have a consistent format, it’s a well thought out campaign. @Will, the original iPod campaign definitely was aimed for the “hipness.” When iPod Nano came out, the commercials became a lot more user centric, as seen here. I find Apple products are “easy and intuitive” already, as you said, the commercials make them even easier. @Stef, the Mac vs. Pc ads are to promote the whole Apple brand. I was a PC user at the time too. I wasn’t offended because I didn’t think it was targeting the PC users, but the PC as a life style. After all, Apple’s trying to sell an experience. This is a great post! I love my iPhone and am thinking of buying an iMac from always owning a PC and its interesting the marketing tools they use to entice you, even though the products are largely similar. They use words like ‘magic’ mouse and ‘family’ when talking to customers. All this makes you feel like its something special and life changing eventhough its just a computer. They are clever though.